This app calculates strong passwords for each alias from your single secret. 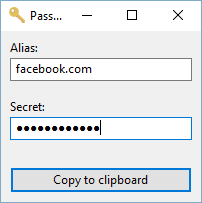 No need to remember dozens of passwords any longer and no need for a password manager! Based on a GNOME Shell extension which uses the same algorithm. Icon made by Madebyoliver from www.flaticon.com is licensed by CC 3.0 BY. Download icons on this website made by Dave Gandy from www.flaticon.com are licensed by CC 3.0 BY.